Her message of hope, inclusion, healing, and unity is needed today just as it was 485 years ago when there was turmoil, division, and cultural clashes. Our Lady of Guadalupe is one of the most prophetic spiritual icons of the Americas and a revered symbol of indigenous people. 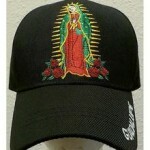 Her familiar image can be found on wall hangings, paintings, key chains, baseball caps, and T-shirt. She was named Empress of the Americas and patroness of the Western Hemisphere by a papal proclamation in the 1998. But the Pope was just validating something that had already come to pass. 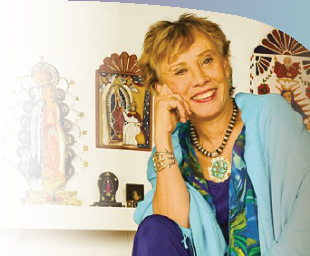 Juana Bordas at The Museo de Las Americas in Denver during an exibition of Guadalupe art. Juana is the author of The Power of Latino Leadershipthat recognizes Our Lady of Guadalupe as a healing force for our hemisphere. The story goes that Juan Diego, an Indian elder wrapped in a traditional tilma (poncho), was walking to church when suddenly he hears celestial music and wonders, “Am I dreaming?” There in the foothills of what is now Mexico City he sees a radiant brown woman with distinct Indian features arrayed as a Madonna. She has stars in her mantle and a crescent moon at her feet. An angel lifts the folds of her turquois dress. “Where are you going the smallest of my children,” she sings in the Nahuatl Indian language. “I am your merciful mother, yours and all the people who live unified in this land and all the other people of different ancestries.” She asks him to go to the Bishop and have a church built where stands so she can hear the weeping of her children and heal their sorrows. 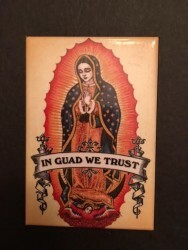 Consider that Guadalupe appeared only 22 years after the conquest of Mexico – a time when an Indian holocaust was taking place. The Indians lost their land, wealth, 85% would die – many from disease. So many Indian women had been desecrated that the dominant off spring of Central and South America today are mixed race. As conquered people, the Indians were desolate. Even their Gods had been taken from them. They needed hope – a spiritual infusion. A miracle! Juan Diego did as the beautiful Lady told him, but of course Bishop Juan de Zumárraga did not believe this peasant who ardently returns again and again. Finally the Bishop tells him to ask for a sign to prove his story. When he encounters the Lady again, he ashamed, that he failed to convince the Bishop to build a Church for her. Her message consoles and encourages, “Let nothing trouble you…for I am here – your Mother…Your fountain of life. You are cradled in my arms. Is there anything else you need?” “Now go to the top of the hill, cut the flowers that grow there and bring them to me. The hill is stony, full of thistles and thorns. It is December the time of frost and brown grasses. Yet exquisite flowers are blooming. He brings them to her and she folds them in his tilde. She sends him back to the Bishop. Juan Diego waits and waits at the Bishop’s house. A sweet fragrance fills the house. Curious, the servants look inside and see exotic flowers inside. They fetch the Bishop and Juan Diego prostrates before him. His tilda opens and beautiful crimson Castilian roses that only grow in Spain tumble to the ground. 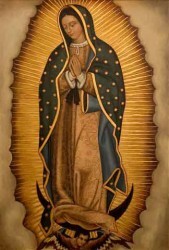 And there in the simple tilma was the brown – faced image of Our Lady of Guadalupe. 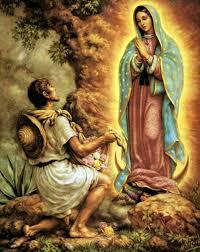 It is still preserved in her church outside of Mexico City – one of the most visited spiritual sites in the world. The image had special symbolisms for the Indians. The rays of the sun worshipped by the Aztecs circled her and her exquisite mantel was their sacred color, turquois. The Indians were great astronomers – silver stars covered her garments. Most telling was the Black sash she wore which was the Aztec symbol of a pregnant woman. But who was the child she was carrying?